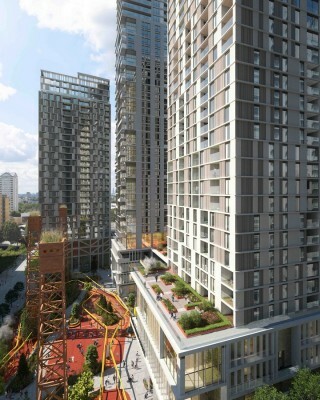 The London Borough of Tower Hamlets has granted planning consent to proposals submitted by Studio Egret West and Hawkins\Brown on behalf of Galliard Homes for a residential-led development of 1500 homes at Millharbour Village. 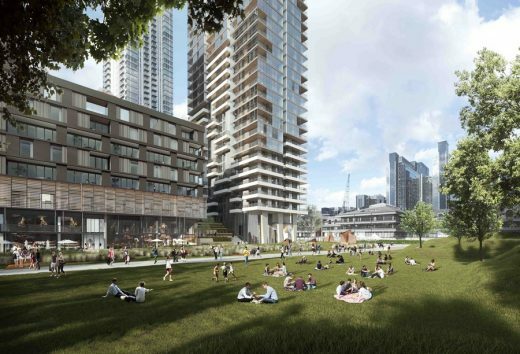 The consent gives the go-ahead for a high-density mixed-use neighbourhood in South Quay, which will include schools, parks, commercial space, office space and 1,500 new homes, creating a significant new community on the Isle of Dogs. 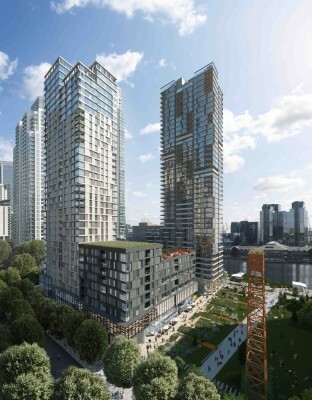 Originated through an Urban Design Framework in 2012 (developed in consultation with London Borough of Tower Hamlets and the GLA), the development will consist of six buildings and will create over a hectare of new public space, including two parks. A new three form entry, state-run primary school will be included and the masterplan will create the capacity for the relocation and enlargement of the existing educational and performance arts uses in the area. “The proposals at Millharbour Village have remained true to the founding principles captured in the original Urban Design Framework. The new public realm and the non-residential lower floor uses fuse together to ensure a strong identity at the heart of the ‘village’. 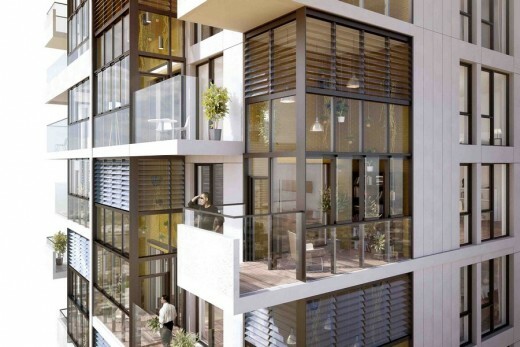 Studio Egret West is the masterplanner and landscape architect for the development. The architecture has been designed by both Studio Egret West and Hawkins\Brown in a collaboration that follows their previous partnership on the Park Hill Estate in Sheffield, where the two practices were nominated for the Stirling Prize in 2013.
have also been distributed between the two practices. A strong emphasis on providing a liveable new neighbourhood is the driver behind the proposals. The introduction of tall, high density, residential buildings is made possible through the inclusion of key community infrastructure. Millharbour West focuses on education at ground level, where the prospect of three new and enlarged schools combine with a new park. Millharbour East has a different focus, again providing park, this time surrounded by ground floor restaurants, cafés and office space, activating the dockside to create a lively civic environment. The traditional boundaries of parks and pavements are broken down, allowing a landscape that reflects the historic character of the Marsh River to permeate across the public realm. In a similar blurring of boundaries the parks include built forms in the shape of tall open structures. These growing frames recreate the industrial language of the dockside ensuring that the parks are not dominated by the buildings, but have a strong presence and character of their own. A new three form entry state run primary school. Potential to relocate and enlarge the existing educational and performing arts uses on the site. Two new parks set within approximately 1ha of new public realm. Housing split includes 27% affordable homes with 21% social rented and 6% intermediate tenure. A single energy centre providing heat and power for the whole development.